One of the reader of this site, Beth, gave me this tip for the full-page ad for Bluebird Photoplays in Internet Archive. I like the use of minimum set of colors, abstract background and quiet, yet evocative typeface. As I discussed before, Bluebird Photoplays had a tremendous effect on early Japanese film-making. The accompanying text on the next page is interesting as well. 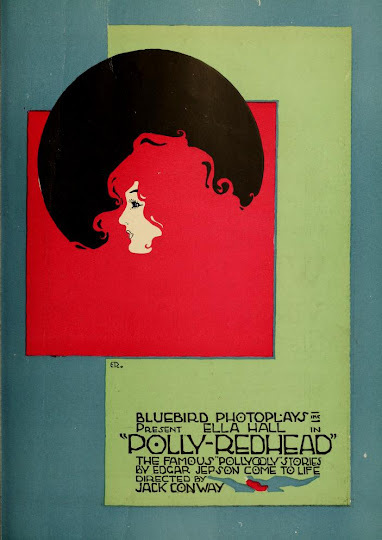 “.. BLUEBIRD Photoplays (Inc.) was the first producer to buck the star system – the ruinous practice that has been responsible for the high-priced but low-grade features that have wrecked many an Exhibitor.” If this is true (it seems to be), this lack of movie stars, focus on drama, might have appealed to the pioneers of Japanese cinema searching for their vision.